Most people believe that eating chocolates causes acne. Is this true? NO! Acne is nothing but a skin problem which normally occur in teenagers. It develops due to blockages in the pores and is aggravated by the hormonal changes that a teenager undergoes during his/her age. A few individuals carry this condition into adulthood too. Acne may or may not be infected and filled with pus. Even though acne is a minor skin problem, the psychological effects of acne are large. Some youngsters avoid public places only to hide their acne faces. 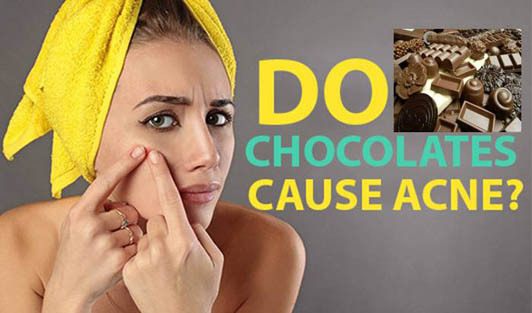 Chocolates, cheese, oily foods and butter have been blamed for acne. None of this is supported by evidence. However, a healthy diet promotes healthy skin and helps to prevent many skin problems. Whether you have acne or not, it's very important to maintain good skin hygiene, to eat right, to exercise and to get some sunshine on your skin. Consult a dermatologist (skin specialist) if you have acne......do not self-medicate.